The Broncos are unlikely to re-sign veteran defensive tackle Domata Peko, according to Mike Klis of 9News. Denver has told Peko and his camp that it won’t attempt to re-up the 34-year-old during the opening stages of the free agent period. While Peko isn’t going to be priority for Denver, it does sound as though there’s a glimmer of hope that he could return to the Mile High City. If the Broncos aren’t able to find enough defensive linemen in free agency, they might be open to re-signing Peko at a later date, per Klis. That, of course, would depend on whether Peko himself was able to find a new team on the open market. 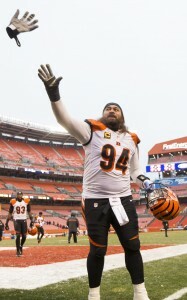 Peko is wrapping up a two-year, $7.5MM deal that he signed with the Broncos in 2017 after spending the first 11 years of his career with the Bengals. Over the past two seasons, Peko has only missed two games, racking up 44 tackles (eight for loss) during that time frame. In 2018, Pro Football Focus ranked Peko as the No. 39 interior defender among 112 qualifiers. If Peko leaves, the Broncos’ remaining defensive lineman will include Derek Wolfe, Adam Gotsis, and DeMarcus Walker. Zach Kerr is an unrestricted free agent, while Shelby Harris is headed for restricted free agency. Devonta Freeman has cleared the league’s concussion protocol and will return to Falcons practice on Wednesday, head coach Dan Quinn told 92.9 The Game, per D. Orlando Ledbetter of the Atlanta Journal-Constitution. Freeman was injured on the second play of Atlanta’s game against the Cowboys in Week 10, and the veteran running back has since missed two additional games as he deals with this second concussion of the season. Fellow running back Tevin Coleman has dominated backfield touches with Freeman sidelined, but Freeman figures to take on the majority of carries from here on out. Like Freeman, Cowboys guard Zack Martin has also cleared the NFL concussion protocol and is on track to play when Dallas faces Washington on Thursday night, reports Mike Florio of Pro Football Talk. Martin played only 20 offensive snaps in what was an eventual loss to the Chargers on Thanksgiving before leaving the contest with a brain injury, forcing the Cowboys to turn to backup Joe Looney to man right guard. One of the league’s best offensive lineman, Martin will attempt to help Dallas win out (essentially a requirement if the club hopes to earn a postseason berth). The Colts will be without cornerback Rashaan Melvin after he suffered a “significant” hand injury, head coach Chuck Pagano told reporters, including Mike Chappell of FOX59 (Twitter link). While Indianapolis’ defense ranks 23rd in DVOA, Melvin has been one the team’s bright spots. A career reserve, the 28-year-old Melvin has started 10 games for the Colts this season while ranking as the NFL’s No. 14 corner, per Pro Football Focus. He’s scheduled to hit unrestricted free agency next spring. Tight end Erik Swoope, meanwhile, won’t return from IR this season although Indy originally believed he would do so, per Chappell (Twitter link). Domata Peko‘s start streak is expected to end at 123 games, as the Broncos defensive tackle has a second degree MCL sprain that will cause him to miss time, tweets Mike Klis of 9News. Peko, 33, looked to be nearing the end of his career with the Bengals last season, but he’s rebounded in Denver. The mammoth interior defender has been outstanding against the run, helping the Broncos to a No. 1 overall ranking in run defense DVOA. The Giants have designated defensive end Romeo Okwara to return from injured reserve, according to veteran NFL reporter Howard Balzer (Twitter link). The 22-year-old started four games as a rookie in 2016, and had played 78 defensive snaps this year before going down with a sprained MCL. Okwara will likely contribute on special teams when he returns to game action. Free agent tight end Kellen Davis visited the Browns today, reports ESPN.com’s Field Yates (via Twitter). The former fifth-rounder has played in 24 games (16 starts) for the Jets over the past two seasons. In parts of nine NFL seasons, the 31-year-old has compiled 53 receptions for 579 yards and 13 touchdowns. The Dolphins hosted free agent linebacker Zach Brown yesterday, and Armando Salguero of the Miami Herald tweets that the team “wants” the former Bill. However, he also notes that the organization isn’t willing to pay big or engage in a bidding war. Meanwhile, Scott Bair of CSNBayArea.com writes that Brown could also be an option for the Raiders. The 27-year-old fired his agent earlier today. Nose tackle Domata Peko had previously said the Vikings were pursuing him in free agency. However, according to Chris Tomasson of the St. Paul Pioneer Press (on Twitter), head coach Mike Zimmer said today that the organization never had interest in the long-time Bengals lineman. 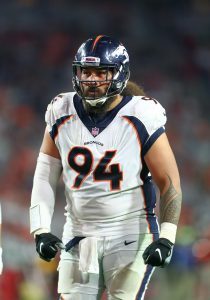 Peko ultimately signed with the Broncos earlier this month. Yahoo’s Charles Robinson tweets that the Eagles had offered defensive tackle Bennie Logan a “sizable extension offer” during the season, which the player turned down. The veteran ultimately had to settle for a one-year deal from the Chiefs worth $8MM. Connected to a high-profile quarterback acquisition for the second straight offseason, Broncos GM John Elway didn’t identify the team’s Tony Romo circumstances as being all that different from the ones that had Denver close to adding Colin Kaepernick last year. “Yeah [it’s a similar situation], because we feel good where we are. There are so many things … everything gets ratcheted. I will just tell you this: There’s been a lot of things out there that are not true as far as what’s going with our quarterbacks. So that’s what happens. Everything gets frothed up,” Elway said, via Troy Renck of Denver7. Renck adds that the latest coming out of Dallas is Romo is growing restless with the Cowboys’ tactics, with the franchise having backtracked on its intention to release him in order to pivot back to trying to trade the 15th-year quarterback. The Broncos remain unlikely to trade for Romo, per Renck, even after the Texans’ cap space-clearing trade of Brock Osweiler. It would be a “major upset” if the Cowboys found a taker for Romo’s contract in a trade, per Adam Schefter of ESPN.com. The Broncos nearly traded for Kaepernick last year, but the sides couldn’t agree on a restructured deal. Denver then selected Paxton Lynch in the first round but turned the reins over to Trevor Siemian for most of 2016. That competition would continue for a second straight year if the franchise doesn’t acquire Romo. Vance Joseph said the franchise is in good shape with Siemian and Lynch for “the next four or five years,” per James Palmer of NFL.com (Twitter link). Lynch is under Broncos control for four more years, with Siemian’s rookie deal running through 2018. Here’s more from the Mile High City. Meanwhile, Elway said his understanding is Kayvon Webster wants to play more (Twitter link via Cameron Wolfe of The Denver Post). Webster has been public about his desire to have a larger defensive role and he won’t get that opportunity in Denver, being blocked on the cornerback depth chart. Webster, who made our list of this year’s Top 50 Free Agents, has long been expected to leave. The fifth-year corner has served as one of the Broncos’ top special-teamers, but after a rookie season in which fewer obstacles resided in between Webster and a defensive role, the Broncos’ 2014 additions of Aqib Talib and Bradley Roby effectively buried him on the depth chart for the ensuing three seasons. Now employing his previous defensive coordinator, Wade Phillips, the Rams are hosting Webster on a visit today. Domata Peko also received interest from the Bengals, Vikings and Eagles prior to signing his two-year Broncos accord, Nicki Jhabvala of the Denver Post tweets. Peko had obvious connections to the Bengals and the Mike Zimmer-coached Vikings but chose to join the Broncos. Elway said the team’s starting left tackle might not be on the roster presently, per Renck, but noted recent right tackle signings Menelik Watson and Donald Stephenson are options there. Watson served as an emergency left tackle after injuries ravaged the Raiders’ tackle corps at a point last season, but Oakland primarily utilized him on the right edge. Stephenson began the 2015 season as the Chiefs’ starting left tackle, when he took Eric Fisher‘s spot, but Andy Reid reversed course and placed Fisher back there. Stephenson didn’t get a starting job back and signed with Denver, where he struggled as the team’s primary right tackle starter. Denver still has interest in re-signing backup outside linebacker Dekoda Watson, according to 9News’ Mike Klis, who confirms the team’s interest in bringing back Vance Walker (Twitter link). Newly signed Kasim Edebali will likely compete for work behind Von Miller and Shane Ray at outside linebacker, Wolfe writes. He played defensive end in the Saints’ 4-3 scheme and 58.7 percent of New Orleans’ special teams snaps in 2016. The Broncos also have Shaquil Barrett as their top backup at outside ‘backer. The Broncos have agreed to free agent deals with defensive linemen Domata Peko and Zach Kerr, tweets Mike Klis of 9NEWS. Peko will receive a two-year, $7.5MM contract that includes $3.8MM guaranteed, per Klis (Twitter link). Kerr will also garner a two-year pact, reports Nicki Jhabvala of the Denver Post (Twitter link). Peko, 32, will now leave the Bengals after spending the past 11 seasons in Cincinnati. The former fourth-round pick appeared in 171 games with the Bengals during his time in the Queen City, starting 156 of those contests. Although he’s started every game for the past seven seasons, Peko’s playing time had started to dwindle, as he’d only managed roughly half of Cincinnati’s defensive snaps over the past two years. Peko registered 37 tackles in 2016 while grading as the league’s No. 106 interior defender, Pro Football Focus, which has given Peko disastrous marks for the past four years. Addressing the defensive line was thought to be a primary focus for Denver this offseason, but Peko and Kerr are the the only defensive linemen the club has added thus far. That’s not for lack of trying, however, as the Broncos were reportedly among the final suitors for Calais Campbell before he signed with the Jaguars. Denver had to ward off other teams in order to land Peko, as the Vikings apparently had interest in the 6’3″, 307 pound defender, tweets Matt Vensel of the Minneapolis Star Tribune. Kerr, 26, was not tendered a restricted free agent contract by the Colts after appearing in 12 games (four starts) for the club last year. Appearing on nearly a third of Indy’s defensive snaps, Kerr posted 19 tackles, 2.5 sacks, and a fumble recovery in his third NFL campaign. Kerr drew interest from the 49ers and Lions before signing with the Broncos, according to Stephen Holder of the Indianapolis Star (Twitter link). 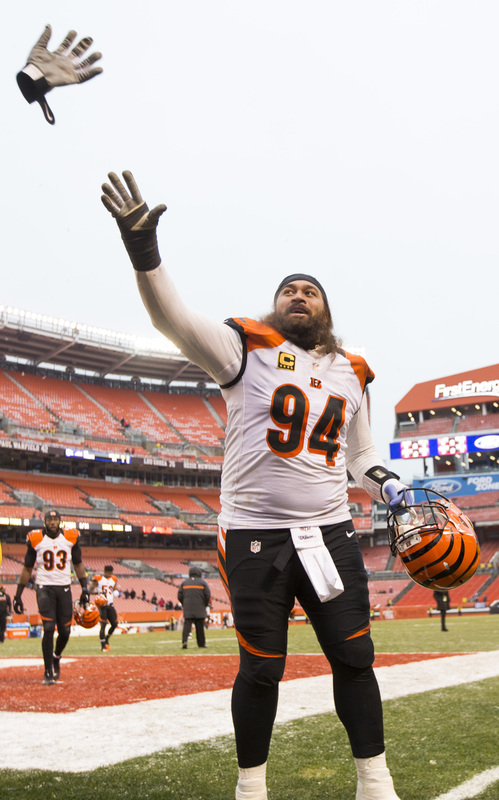 After playing 11 years with the Bengals, Domata Peko could be heading elsewhere. A healthy market exists for the 32-year-old defensive tackle, with the Vikings, Eagles, 49ers joining the Bengals in pursuit of Peko, Chris Tomasson of the St. Paul Pioneer Press tweets. Tomasson reports the Vikings have reached out to Peko’s representatives regarding a possible free agent pact. Peko’s Bengals tenure overlapped with Mike Zimmer‘s time in Cincinnati, and Tomasson notes the Samoan is a favorite of the Minnesota coach. The Vikings have brought former Bengals Terence Newman and Emmanuel Lamur to the Twin Cities under Zimmer, and the team has some uncertainty at defensive tackle. Linval Joseph‘s counterpart, Sharrif Floyd, saw injury derail 15 games of his 2016 season. The Eagles could be in the market for a new running mate for Fletcher Cox, with Bennie Logan taking part in the legal tampering period as a first-time UFA. The 49ers are planning to convert to a 4-3 scheme under new DC Robert Saleh, and although they have 5-technique ends DeForest Buckner and Arik Armstead, the rebuilding team could be hunting for depth on a team that doesn’t have much. The 49ers, though, may need Peko least among his primary suitors after adding Earl Mitchell as well. Peko did not record a sack last season but registered a career-high five in 2015. However, he’s proven incredibly durable during his lengthy NFL run, having started in 16 regular-season games in each of the past seven seasons. He only graded as Pro Football Focus’ No. 106 interior defender last season, playing 593 snaps. The Bengals have Pat Sims and Andrew Billings accompanying Geno Atkins on their defensive tackle depth chart. Former Jets second-round pick Devin Smith is confident that he’ll be able to contribute to the team in 2016, according to Zac Jackson of ProFootballTalk.com. The wideout was banged up for most of training camp last year, and his season ended following a torn ACL in December. “Physically, I feel great,” he said. “My weight is up. I feel healthy. The trainers have pushed me in the right direction. The trainers at the Jets have been great. I feel totally comfortable that they’ll have me back when the right time comes. They watch me closely and we have great communication. Jason Fitzgerald of OverTheCap.com explores some of the Bengals best and worst contracts. Quarterback Andy Dalton‘s six-year, $96MM contract (with $17MM guaranteed) is rated as the best, while defensive tackle Domata Peko‘s two-year, $9MM contract (with $4.4MM guaranteed) is named the worst. Broncos safety Shiloh Keo had pleaded guilty to a misdemeanor charge of driving under the influence, reports Nicki Jhabvala of The Denver Post. The 28-year-old was arrested in February in Idaho. The Titans made quarterback Matt Cassel a priority in free agency, writes Jim Wyatt of TitansOnline.com. General manager Jon Robinson and coach Mike Mularkey were both fans, and Robinson was familiar with Cassell due to their Patriots roots. With Robert Geathers now out of the picture, Coley Harvey believes there’s little chance that the Bengals move on from defensive tackle Domata Peko. While the 30-year-old didn’t have a great 2014 season, the writer opines that he played well at times, and Harvey notes that Peko is viewed as a leader in the locker room. Considering the Bengals only have A.J. Green‘s future contract to worry about, Harvey could envision the team making a splash in free agency. The writer suggests Greg Hardy and Jerry Hughes as options, but he warns that the duo may prove to be too pricey. If the Ravens lose out on Justin Forsett in free agency, Jamison Hensley says the team will pursue a running back in both the draft and free agency. The team still hopes to keep the veteran back, though, especially considering his impact on younger players. Hensley isn’t worried if Torrey Smith ultimately decides to leave Baltimore. When taking a look at potential cap casualties in the wideout market, the writer points to Saints wideout Marques Colston as being an option for the Ravens. Michael DiRocco says the Jaguars focus heading into free agency is acquiring a wideout, a right tackle and a “pass-catching” tight end. The writer suggest Randall Cobb, Bryan Bulaga and Julius Thomas for each of the three, respective positions. Bill Williamson believes the Raiders could trade their first-round pick as they look to compile as many selections as possible.